...because we have a ton of exciting things coming up on The Oregon Wine Blog. Let me preface by reminding all TOWB'ers that like most in the wine industry, our staff all have day jobs which become very very busy during the month of September. Gotta pay the bills, you know? As a result, plans are subject to change, although our team is dedicated to providing our readership with a quality product, on-time, 95.9% of the time. In the next few weeks you can look for the following features. First up, we've dispatched a crew to cover Celebration Oregon! The Oregon Wine Awards Ceremony and Tasting on Friday at the Oregon State Fair. A spectacular evening of sampling Oregon's award winning wines...AND...elephant ears. What more could a wine writer ask for? Maybe a bacon-covered maple bar from Voodoo Donuts in Portland, but what can you do? Actually, some of Oregon's top chefs are showcased at Celebration Oregon! so there will be great food abound. Secondly, we have a team headed to the heart of Eastern Washington wine country this weekend to do some features on the wine and experience of Columbia and Walla Walla Valley. We've got a bit of driving ahead of us, but totally worth it for some good old Red Mountain wine. Do you have any "must-see's" in the Tri-Cities for Walla Walla? Leave a comment. For your stalking pleasure, we've included our route map. Finally, spanning mid-September into October, we're excited to publish a series on the non-traditional wines of the Pacific Northwest. Malbec, Barbera, Sangiovese, Lemberger, what? We'll tell you what - and include some reviews of local producers of these unconventional NW varietals. Put on your bib, strap one some boots, and pour a big old glass of Cabernet. This is going to be quite the journey! This is not really Tri-Cities, but certainly near Walla Walla. When I was rolling through there, I would have to say my favorite stop was L'Ecole No. 41 on Hwy 12 just west of Walla Walla. On the last trip to Walla Walla, we brought home 3 cases of wine, of course we drank a bottle or 12 over there. Favs...Alexandria Nicole on the way or way back, call ahead to meet with Matt at the winery. Forgeron, sapolil, trust/Chateau Rollat, and spring valley were among the most fun with great wines. Keep in mind we have only hit about 20 of the 120 that are supposed to be there! 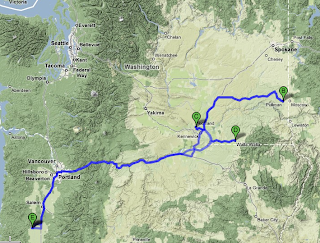 Here are AOC Travel Guides latest must try wines from our recent Oregon and Yakima Valley trips! Some of these are very new wineries and some have been around but have new owners. Starting with Antica Terra, made by the brilliant Maggie Harrison (formally of SQN) Don't miss,Lenne,Coelho,Big Table Farm and Whistling Dog. For Yakima the star right now in our opinion is Cultura, what a knock out, they are under the radar but not for long, is our guess. For food in Yakima with relatively slim pickings there is the new steak house, Tony's almost a perfect experience and try Picazo 7seventeen in Prosser. In the Willamette They get it at, Farm to Fork and Crescent Cafe! That's it for now, lot's more to come! You should defintely stop by Prosser on your way through. Try Picazo 7Seventeen Wine Bar and Restaurant, great local wine list and to die for Chorizo stuffed Prawns wrapped in Serrano ham. Heard oysters are a must try at Whoop em up Cafe in Waitsburg. I have a friend from the area and he brags about the quality there. Thanks for reaffirming.